Inforum language school's staff and management have a great experience in the English language teaching industry, not only in Australia but all over the world including Portugal, Turkey, Korea, Japan, China, Mongolia, Indonesia, Brazil and many other places. We are all fully qualified, native English speakers who continue to train through Inforum Education’s intensive professional development programme. We are passionate about incorporating the latest techniques into our teaching, with a strong emphasis on communication, while supporting and challenging our students to achieve their language learning goals. Our administrative and management teams are always available to assist you with any question you may have. We encourage you to come and speak with us anytime. Even if you don’t have a question, just come and say, “G’day!”. Even our Director, Simon, has his door open and is ready to have a chat with you. Studying General English at Inforum is different to any other college. We focus on interaction and communication so you’ll be speaking a lot from Day 1! TOTAL: 23 hours to 26 hours! At Inforum you’ll study Core Skills in the morning and then in the afternoon Focus Classes, you’ll have the chance to practise and apply your knowledge in new and exciting situations. Inforum’s levels follow the CEFR (Common European Framework for Languages) so you can be confident that what you are learning will be relevant anywhere in the world. Our flexible format allows you to start any Monday throughout the year and our Cambridge-trained teacher examiners will ensure your success through a combination of stimulating classroom practice that includes producing accurate written work, speaking confidently, reading a variety of texts at speed and listening and note-taking under exam conditions. Intermediate level or placement test. Inforum’s Advanced Master Class is a unique program that combines the latest teaching research and theory to develop advanced grammar and vocabulary knowledge quickly and accurately. Students then apply these in the afternoon Focus Class to improve examination skills. Our blend of advanced learner methodology, examination practice and experienced staff makes this a stimulating and rewarding program for high achievers. Intermediate level, Cambridge FCE or placement test. Inforum’s specialist IELTS staff have written this program to develop the necessary skills in order for students to achieve high level IELTS band scores. There is a strong focus on advanced reading and writing skills, such as skimming, scanning texts, labelling diagrams and composing essays under exam conditions. The average student at this level should expect to achieve IELTS 7.0 or higher. Cambridge FCE, Advanced Master Class, or placement test. Infourm is the best school because all teachers are really kind, friendly and specifically they completely know how to teach English. They not only teach me English but also teach me Australian history, slangs and whatever! When I came here almost 1 year ago, I was in an Elementary class. I mean that I couldn't speak English as well as I can. Even just exchange greeting was extremely hard for me. My main aim is that I really want to pass FCE or want to get a high score of IELTS. So I still need to study much harder than now. I`ve been studying at Inforum for 7 months. I didn`t understand English at all when I came here for the first time. Fortunately,I had already decided to go to Inforum before I left Japan. I was able to meet awesome teachers,new friends,staffs and especially, Simon and Jun who are our school director and his wife. They gave me English skill and second families. If you are thinking about learning English somewhere,I completely recommend hear. I'll study at Inforum till next year. I have been studying at Inforum for 8 months, since I arrived I realized that it has been the best choice that I could have ever made. All the teachers are native speakers with several years of experience, all courses are organized to fit the student according to their needs to achieve their goals. The thing that I loved the most is the envirorment at Inforum, not just a simply school but a comunity to share experiences and memories. 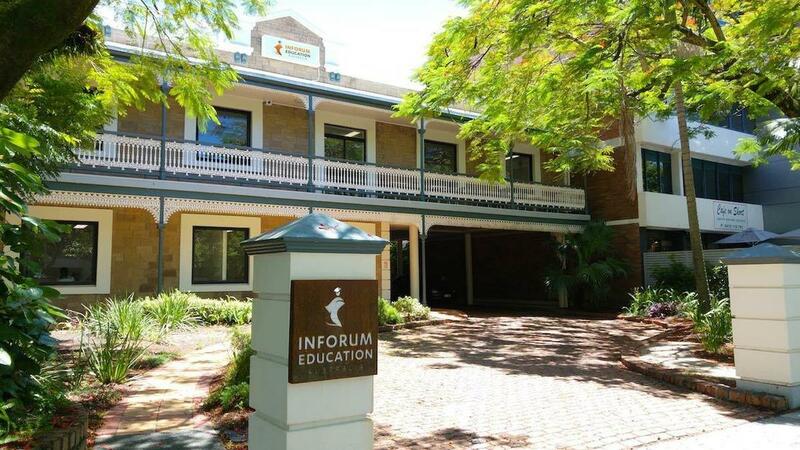 Inforum is my first home on the Gold Coast, a landmark during my life in Australia. The amazing school I have ever been!! This is the best school in the world! I've been studying here for 2 years. I am from Japan, and there are international students here I made many friends. People are amazing! Atmosphere of school is awesome!! Just come here!! You\'ll see it! !